Tata Harper, to the natural beauty, is sort of like caviar to the foodie. It’s one of the most luxurious and trusted companies out there that supports the use of all natural ingredients that are biocompatible with our skin. According to their website, Tata Harper packs between nine and 29 active ingredients into each bottle, (most cosmetic formulas contain between one and three) and they manufacture in small batches so you know that your product is fresh and hasn’t been sitting on a shelf for two years. All right, enough love for now! 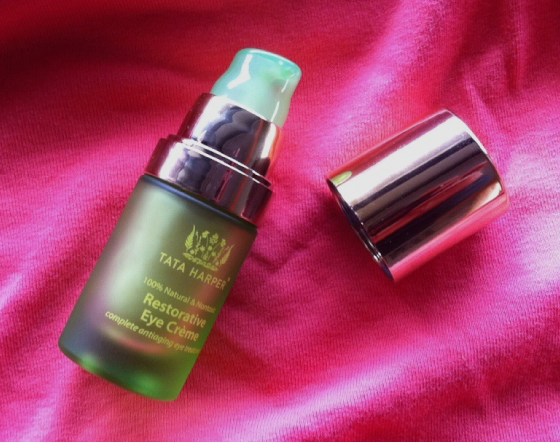 Jennifer was so kind this Christmas and got me Tata Harper’s Restorative Eye Créme ($90 for 15 ml). Being an eye cream junkie, you can imagine my glee! I want to tell you what sets Tata apart for me in the eye cream department. You know who put the fear of God into me when it comes to under-eye wrinkles? KATHRYNE. …starting when she gave me my first eye cream on my 19th birthday (thanks, girl). I wish I could say that I’ve been extraordinarily proactive since then, taking utmost care of my delicate under-eye skin, wearing SPF 60 everyday and teaching myself how to smile without crinkling my eyes (could that work?). The reality is, I’ve been doing nada for my under-eye skin for the past four years or so (I’m sorry, sensei!). 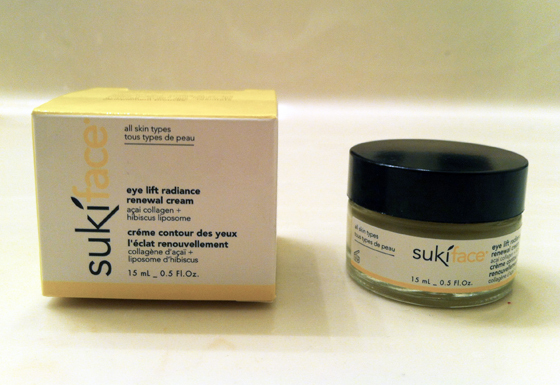 This Cyber Monday, my fear of aging finally eclipsed my nonchalance (the 20% off sale at Beauty Sage also didn’t hurt). I’m in my mid-twenties now, and while I think society’s obsession with preserving youth can be pretty disturbing, I’d also be lying if I said I didn’t want to look as fresh-faced as possible for as long as possible. It’s empowering to take care of your skin, body and face in a way that maximizes your happiness and makes you feel good about your choices (that’s what this blog is all about!). 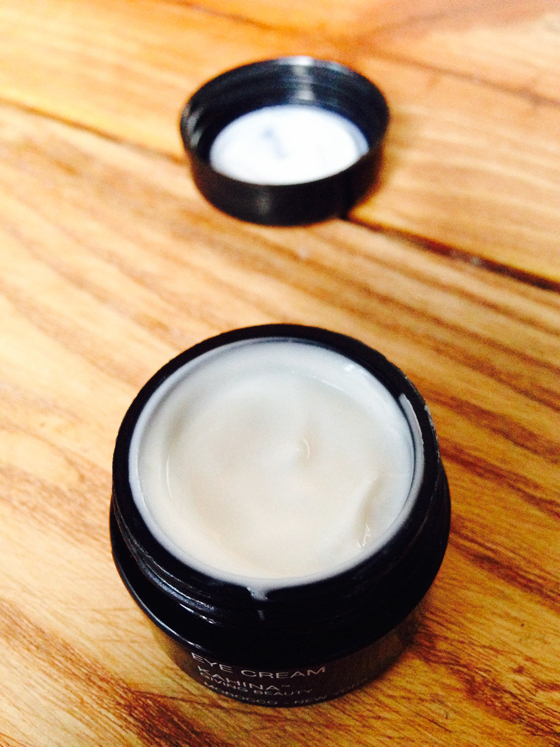 And right now, for me, it feels good to use a natural, luxurious eye cream to ward off wrinkles. Enter Kahina Giving Beauty’s Eye Cream. All right, listen. I have a sordid history with eye creams and products. The skin around my eyes is pretty sensitive. I think most people have relatively sensitive skin around their eyes, right? One generally doesn’t have “tough” eye skin – unless you’re like, a cowboy, or something. I have used everything from Chanel to Olay, Mario Badescu to Garnier. I would never say I have tried it all, but my quest to have moisturized, young-looking and dark circle-free eyes has really run me a relative fortune. Since going “all natty,” though, I feel I have become a hermit of epic proportions: staying on my computer for hours looking up reviews on a gaggle of different natural eye creams. Waiting for my “sullied” products to run out, I wanted to find THE BEST possible creams for my face. My goal was to find something that was going to help me combat fine lines, puffiness, and would really moisturize the heck out of my eye area. We all know what it’s like to have to reapply moisturizer whether it’s on your face or body because it simply absorbs too quickly. My budget was anything up to 60ish dollars. That may seem like a lot for an eye cream, BUT – with a regimen of using my DIY eye cream coupled with a newly bought eye cream, I estimate it will last me four or five months. That’s not bad, eh? That’s like, 12 bucks a month. Doable! I love skincare. Oh my, oh my…I am a skincare sucker. 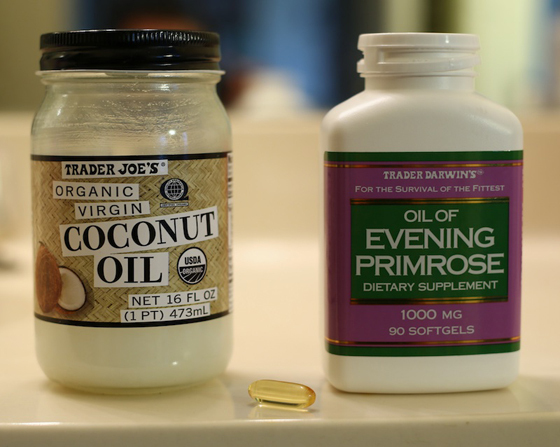 As far as products go: does it promise me eternal youth? Can it shrink my pores? Will it preserve my 20s for me even when I’m 50? I’ma buy it. Got $60 to my name? I DON’T NEED TO EAT. I have had a love affair with high-end skincare since I was 19. It all started when an 80-year-old woman stopped me on the streets of NYC. She took my hand and looked into my eyes and said, “You look so angry, you’re furrowing your brow. Stop that or you’ll look like me in 10 years! Take care of your skin!” I kid you not. It haunts me to this day. Afterwards, I walked into Macy’s and bought everything I could find that said “anti-aging” on it. I didn’t know at the time there were ingredients in some of those products that were harmful to me. Like…really harmful. Instead, I believed what it said on the (beautiful) bottles of serums, plumping agents and moisturizers…claims that are rarely ever true. Now, at nearly 29, I care far less about preserving my young face than I do about being really healthy and CLEAN about it. I don’t want to hurt animals, the environment, or use scary chemicals to make sure I am line-free. Plus, I happen to think my laugh lines are ridiculously adorable, thankyouverymuch.